Not all classical music is well known. Bach, Beethoven, and Brahms represent the top 40, if you will, of classical artists, and even within their repertoire there are pieces that are better known than others. (Can anyone hum “Wellington’s Victory,” Beethoven’s Op. 91 work?) Some works are played less often because they require a very large orchestra, or a very small one; some are played less frequently because they require a very expensive score. Still others are rarely performed because the abstractness of the piece makes it less accessible for general audiences, and other pieces simply fall by the wayside for no reason whatsoever. 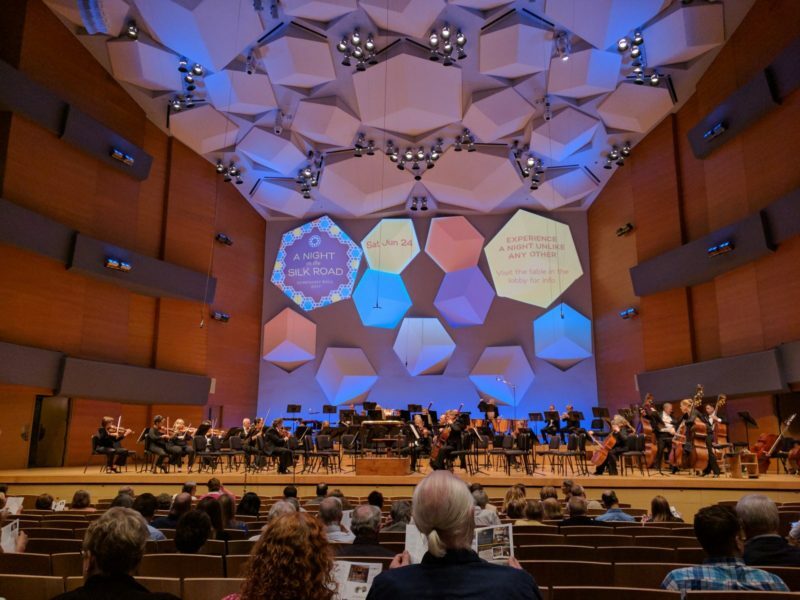 While two out of the three works on the Minnesota Orchestra’s May 11–13 concert are by composers who may not be familiar to infrequent symphony-goers, it’s not for lack of listenability. This weekend’s program starts with the Little Suite by Witold Lutosławski, a set of arrangements of Polish folk tunes. The first, Fajurka, translates as “fife” and, indeed, starts with the orchestral version of a fife (a piccolo) over chords in the string section. The program notes, written by Eric Bromberger, compare the piece to Béla Bartók’s Romanian Folk Dances, but one could also easily make a comparison to the opening of Stravinsky’s Le Sacre du Printemps (The Rite of Spring), with its lyrical melody and strong rhythmic ostinato. The folk tunes make the work more accessible than some modern classical works; they provide a melody to hold on to, regardless of the chromaticism underneath. The headline work, Mozart’s Sinfonia Concertante, features both violin and viola. What’s the difference? Well, as any violist can (and will) tell you, the composer liked the viola better. (In addition, the viola burns longer. Also, it holds more beer. Or perhaps there is no actual difference; the violinist’s head is just bigger. In full disclosure, I must mention that I’m married to a violist.) Listening to the composition, it seems obvious that Mozart did love the viola, whatever his feelings on the violin (for which he composed five concerti and more than 50 sonatas). The program notes describe it as the best of his string concerti, and there’s no question that it is. The viola is usually described as a bigger violin, but more than that, it’s pitched a fifth lower and has a much darker, deeper color. Mozart shows off the differences between the violin’s color and the viola’s in a way that’s unmatched by nearly any other piece composed for these two instruments. This weekend’s featured soloists are Erin Keefe on violin and Matthew Lipman on viola; the former is the concertmaster of the Minnesota Orchestra and the latter is a soloist and the 2012 winner of the Friends of the Minnesota Orchestra Young Artist Competition. Ms. Keefe played with an incredible amount of precision, rhythmic and musical, and it was clear that she is an accomplished soloist in addition to being the seasoned leader of a major symphony orchestra. She and Mr. Lipman played against each other well, her rock-solid leadership contrasting with his playful showmanship. The work was a delight to watch as well as hear, and the audience reacted with a long standing ovation. After intermission, Sam Bergman, a violist and the host and writer for the orchestra’s Inside the Classics program, came out to introduce the last work on the program, Paul Hindemith’s symphonic work Mathis der Maler (Matthias the Painter). It’s a 25-minute, three-movement work drawn from Hindemith’s opera of the same name about Matthias Grünewald, the painter of the altarpiece for St. Anthony’s Church in Isenheim sometime in the early 1500s. 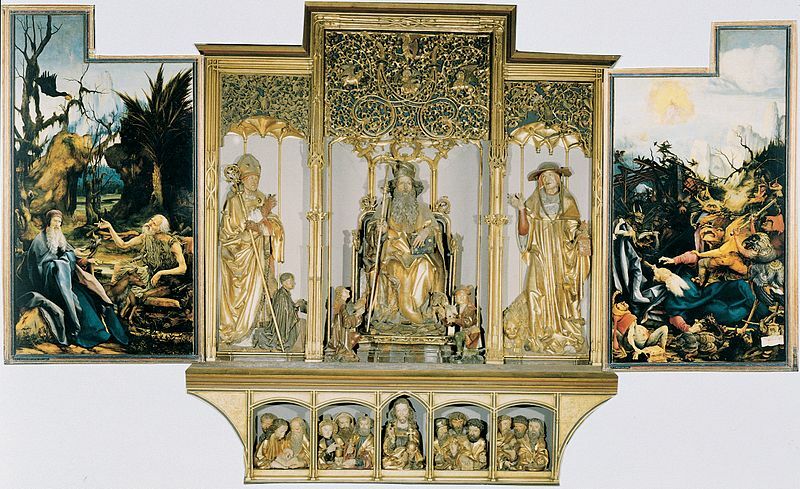 Matthias Grünewald, Isenheim Altarpiece (third view). Via Wikimedia Commons. So little is known about the man that Hindemith was able to tell whatever story he wanted, and the story was largely of a man who sets aside his painting to take part in a series of peasant revolts. The piece was written in the early 1930s and is, like the Lutosławski, rather accessible; while Hindemith also incorporated songs into his work, it’s really the style that makes it easy to find something to follow. Hindemith’s music is often described as “busy,” and with rapidly shifting keys, rhythms, and dynamics, the first and third movements will leave no listener bored. The second movement has lush string harmonies as well as the expected dynamic changes, but the real show-stopping moment of the piece is the very end, when the brass comes in with the final Alleluia. The Minnesota Orchestra’s brass was just on the correct side of too much—joyful and triumphant and a perfect ending to the concert. The Sinfonia Concertante, the titular work of this program, is the middle work and by far the most conventional; on either side are mid-20th-century works. However, those who aren’t familiar with the works should find them interesting and listenable. Both works share another trait, though: they were written under adverse political conditions. Hindemith was staring down the rise of the Nazi party, and Lutosławski was writing under the restrictive conditions of the Soviets. It’s a good question, a strong question, and one that spans the ages. But is it even a choice? Hindemith did attend to his art—he kept composing—but he wrote about a painter who took part in peasant uprisings. Lutosławski composed works based on folk songs, but he was able to keep composing and stay alive. Sometimes attending to one’s art is engaging in the struggle, and it can be enough. The Minnesota Orchestra will repeat this program at 8:00 p.m. Saturday, May 13, at Orchestra Hall in Minneapolis. Some tickets are still available here.